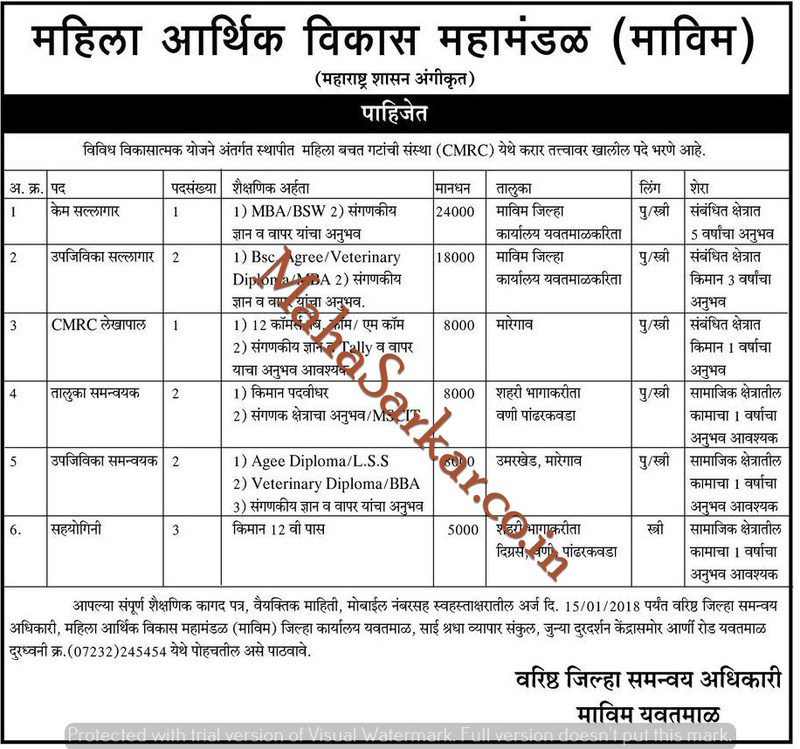 MAVIM Yavatmal (Mahila Arthik Vikas Mahamandal), Yavatmal Published Job Notification for 11 Occupational Consultant – Collaborator & More Posts. Candidates who wish to apply must look at MAVIM Yavatmal Recruitment 2018. Eligible candidates can apply offline before 15-01-2018. Education Qualification: MBA/BSW/B.Sc Agree/Vererinary Diploma /MBA /12th/ B.Com/M.Com /Degee/BBA and More. For Post wise Education Details follow the detailed advertisement. Interested & Eligible candidates can send their application along with all the necessary documents and testimonials to District Co-ordination Officer, Mahila Arthik Vikas Mahamandal (Mavim), District Office, Yavatmal, Sai Shraddha Trade Complex, Near Older Doordarshan Kendra, Arni Road, Dist. Yavatmal – 445 001. Starting Date, Last Date to Apply Offline at Mahila Arthik Vikas Mahamandal which candidates should be remember as follows. Start Date to Apply Offline: 02-01-2018. Last Date to Apply Offline: 15-01-2018.